A rising star in the music world, guitarist Tali Roth has performed throughout the United States, Europe, and her native Israel. Since her Carnegie Hall debut with the Julliard Orchestra, her U.S. concerts have included Lincoln Center’s Alice Tully Hall (with violinist Midori), the Caramoor Center, and the Aspen Music Festival. I had the pleasure of interviewing Tali Roth in New York City. We discussed her latest CD, Nuevo Tango, as well as aspects of technique, her studies abroad and performing Piazzolla’s music. After I did my military service in Israel I went to the Jerusalem Academy, then I came to Julliard in 1991. I left New York in 1993 for a year and half to Cologne, Germany because I got this great scholarship to study with Hubert Kappel. Tell me a little about your experiences with Hubert Kappel. It was great. It was a whole different approach. I knew him from before because I went to some classes in Hungary. The Festival in Esztergom was my first encounter with Hubert Kappel. I was very excited. I also performed concerts there. I really liked Hubert so I went to study with him in Germany for a festival that he did. This was all before I came to N.Y. Then when I came to N.Y. that is when I received the scholarship to study in Germany with Hubert. 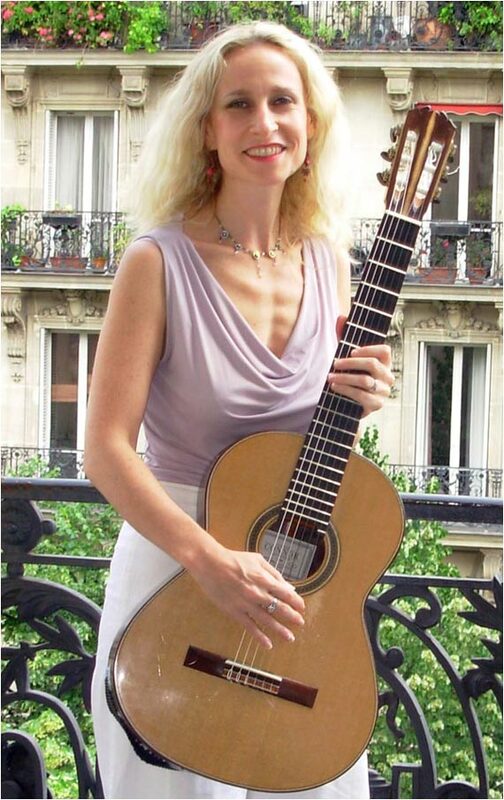 When did you become faculty at the American Institute For Guitar in N.Y.? In 1995-96. 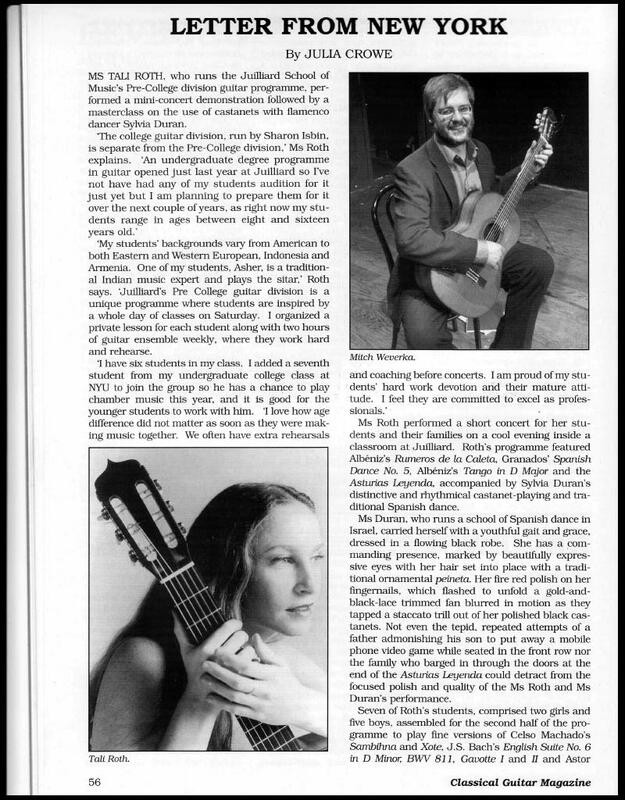 American Institute for Guitar is a real unique school. They don’t offer degrees but many of the players they produce are very high level. The concerts they put on are very impressive. They have fantastic teachers and students. It’s a great service they provide. We put on concerts every couple of months. I also direct my guitar quartet at AIG. I am very proud of it. My vision is to have a larger ensemble, like a guitar orchestra. Do you feel that you have to practice scales everyday? I am pretty fanatical about my scales actually. I practice about an hour of scales and slurs everyday. Even if I don’t practice much, I try to keep that hour for scales and slurs to keep me in shape. I will not go on stage without doing that. Slurs for strength, independence, and flexibility and scales for speed and coordination. I am the same way with my students. Half the lesson is on technique. I check them (students) out every lesson. Are you tough on your students? I think I am very understanding because a lot of my students are working people and are very good amateurs and I understand that some cannot achieve a professional status. However, if they want to study with me, they will have to be methodical. They have to follow my method if they want to be with me, otherwise I think it will be a waste of time for them. What advice would you give to conservatory students that are considering pursuing guitar as their profession? I’d say it is a great profession if you are absolutely crazy about it. I would say in any of the arts probably, if you are not absolutely loving it, don’t do it. It’s great to be on stage but most of the time you spend practicing. I am very simple in my approach to that. I think you have to do the best you can to be prepared. A lot of anxiety occurs because we think that we are not playing a certain piece as well as we should. “I am not prepared, I don’t know if I am ready.” The more you are prepared, and the more you like yourself, that is already a big step in feeling confident. That’s only one thing. But the other aspect that is equally as important is mental work. This includes memorizing the piece in your head. Not just being able to play the notes, but memorize everything. What both hands are doing. The dynamics and colors. I spend some of my time before a concert on mental preparation. Learning the notes, reading the notes does not mean you are on top of it. Your latest CD, Nuevo Tango, has many interesting arrangements, and you included Humberto Ridolfi on violin and Pablo Aslon on bass, who just gave the CD an amazing fresh approach to Piazzolla’s music. Yes. 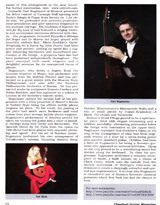 They are two top-notch Tango musicians/players, nationally acclaimed. I actually started working on Piazzolla pieces for a long time but I never thought of doing Chamber. I played the solo pieces and when I met the players, I met the violinist first, we had an amazing chemistry. We worked a lot together and he inspired me a lot and likewise he said I inspired him to change his tango technique. We didn’t think about “I am playing guitar and he is playing the violin.” This is the approach to the CD. We didn’t think about what each instrument did but how we can express the music. The guitar is doing a lot of bandoneon parts. Was it a difficult project? Very hard. It took us two years. This project was very emotional as well. We started the recording before the night of September 11. The whole month after September 11 is when we recorded the CD. The day of September 11 we were rehearsing. We didn’t know what was going on. My father called me on the phone to tell me. What draws you to Piazzolla’s music? I always loved tango. In Israel we are very Spanish oriented. I always felt very connected to Spanish music. You have to feel very connected to the music and you have to work tremendously hard because to get the feeling out you really have to master the technique. It’s a lot of crazy stuff I’ve never done on guitar. All types of slides, chord slides. 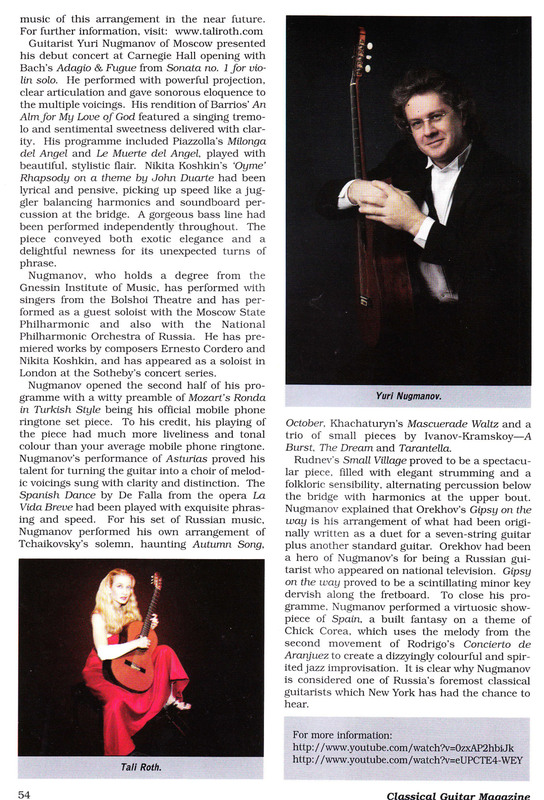 In the trio piece, with Otoסo Porteסo, in the beginning I am doing an imitation of the bandoneon. I am doing this imitation by sliding the chord from up and down the guitar. The bass player helped me by thinking of slides on the guitar that I would not normally execute on the guitar. The key to this music is to think about the expression of music rather than the actual instrument. Especially because this was not written for the guitar but for the bandoneon. 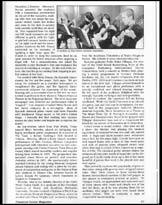 Even though Piazzolla did not want dancers in his music, he wanted to break away from traditional rules of tango (hence the term, nuevo tango) but now many performers use dancers with Piazzolla. I try to add some dancers in my program, at least four dancers in the program so that the audience gets the feel, and when I perform with dancers, it helps the music tremendously. It’s fantastic, you feel the emotion and the adrenalin rush. This is another thing if you want to effectively play this music. I recommend you play with dancers. It’s like playing Flamenco and not working with dancers. One of the things that have struck me about Piazzolla’s music is that it has a dark and beautiful side to it. If Tali Roth has her way, we’ll all be dancing at close quarters with suitably intimate lighting and music as a backdrop. 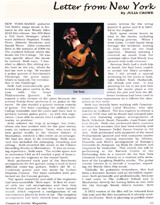 Fresh from a sell-out appearance at New York’s Carnegie Hall, the Israeli-born classical guitarist will put on a local performance of Argentina Tango Nuevo at Tel Aviv’s Einav Center tonight and Saturday night. All that seems to add up to a captivating form of entertainment. Besides Roth, Argentinean violinist Humberto Ridolfi and local cellist Hagit Glaser, the Argentina Tango Nuevo troupe also includes mezzo-soprano vocalist Bavat Merom and tango dancers Kali Tzarfati and Sagi Abiri, who also dance with the Israeli Philharmonic Orchestra. In fact, Roth couldn’t have chosen a more qualified colleague for the project: Ridolfi’s father was Piazzolla’s bass player. “Humberto’s got it in his blood,” Roth says. It is probably no coincidence that Piazzolla sought to marry two seemingly disparate musical genres. Both jazz and tango started life as dance music. As jazz became increasingly intricate, particularly following the transition from swing to the highly technical bebop, audiences began to listen to live jazz ensconced around club tables or in auditorium seats. 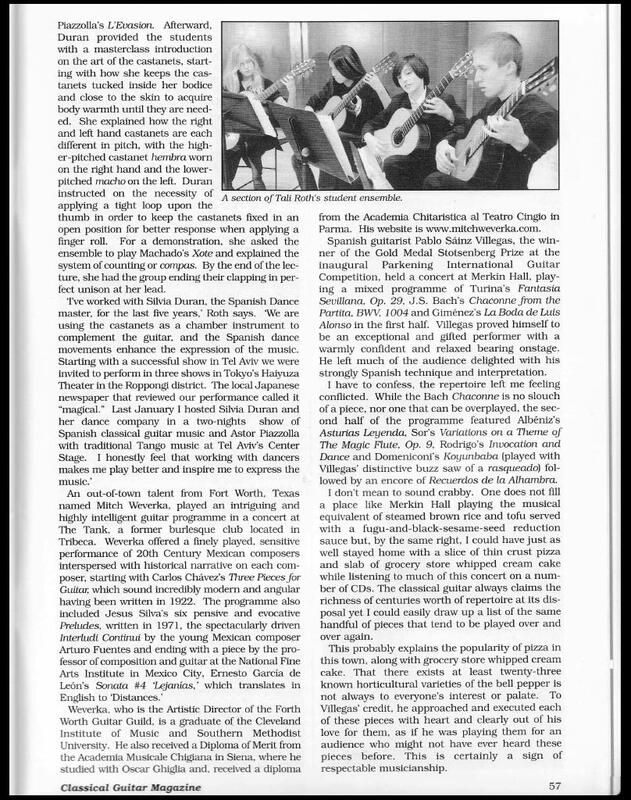 One wonders what Piazzolla, who died nine years ago, would have thought of the Argentina Tango Nuevo show. Considering the large Hispanic population of New York it is not surprising that the Roth troupe filled the place. But what about our own small, multiethnic country? 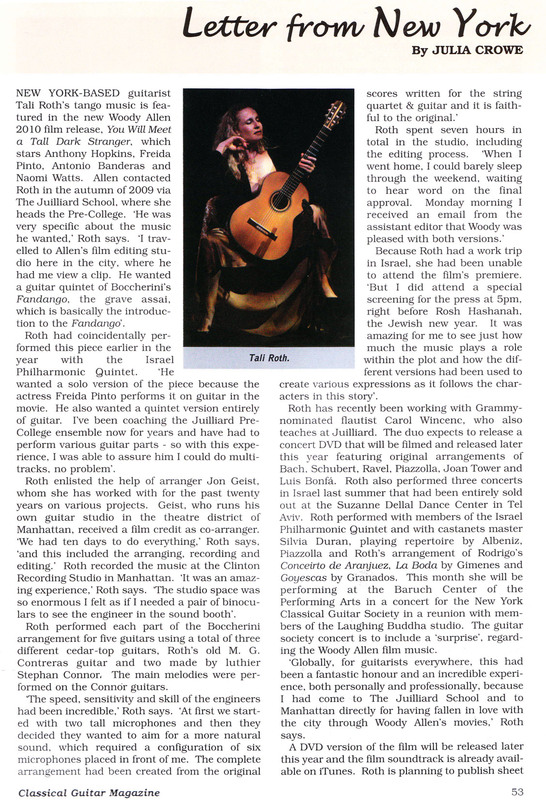 Does Roth expect the two Einav Center performances to be sold out, even taking the venue’s decidedly less-than-Carnegie Hall capacity into consideration? “There’s a lot of classical Spanish and Latin music here too. Roth, however, does admit to having an ulterior motive behind her wish to bring the show to Israel. “I thought, especially at this difficult time, this kind of music makes people a little happier and would help them forget about the problems and bring them into a different world. “There’s a kind of naivete to this music that’s healthy. I also think people have a greater need for romantic music these days. I think the more you are surrounded with difficulties the more you want to escape.